More than 20 years after Mallrats debuted, America’s malls are no longer the arcade- and Spencer’s-packed draws they once were. Teens don’t spend hours chewing bubble gum by the escalators or contemplating ear piercings at Claire’s, and it shows: Analysts predict a quarter of American malls will close within five years, according to CNN Money. But there’s one bright spot amid the gloom: food courts. CNBC reports malls have realized food courts were the original food halls, and that offering unique dining options is a way to draw in customers who aren’t flocking to Sears or JCPenney anymore. 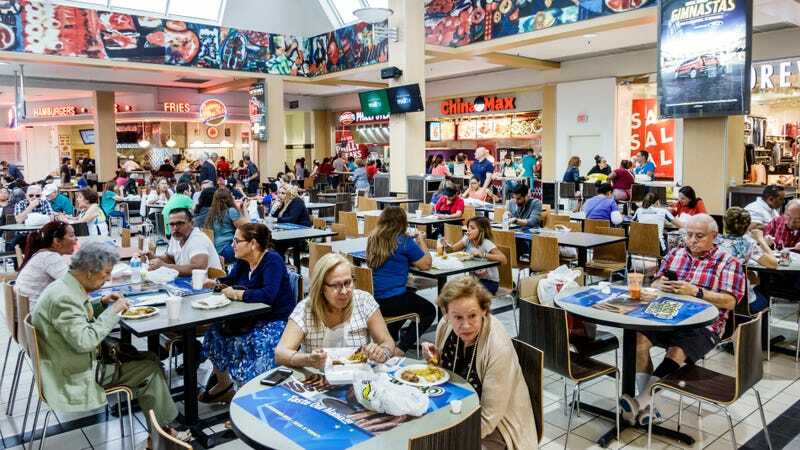 These days, 40 percent of customers will choose to visit a mall based primarily on the restaurants it offers, according to research from commercial real estate services firm Jones Lang LaSalle. And, customers who spend more time browsing shops are the ones who’ve just eaten. It’s hard to shop on an empty stomach, after all. But malls aren’t banking on Orange Julius or Auntie Anne’s. (Though, an aside, I personally would hit up a freestanding Auntie Anne’s, if such nirvana existed.) Increasingly, shoppers want cool restaurants, not the megachains. Malls are adding outposts of local franchises, or are leasing space to hipper chains like Shake Shack. CNBC reports mall real estate company GGP introduced a pop-up food hall in Northbrook, Illinois’ Northbrook Court mall called FOMO—“fear of missing out,” in teen speak—that rotates restaurants in and out of the space. Because shoppers can now buy almost anything they’d get at a mall with just a mouse click or phone screen tap, malls have had to find draws beyond retail. The chance to brag about visiting a cool new restaurant is an experience that, for now, shoppers can’t find on Amazon.